ryan and i were in charge of making dessert for easter this weekend. it's a tradition to have carrot cake on easter sunday, so we made carrot cake cupcakes with cream cheese frosting. they are always so yummy! in addition, we also made a coconut cake. 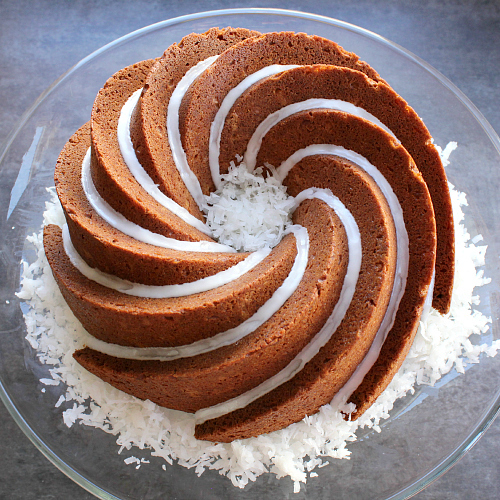 this past christmas one of the things on ryan's wish list was this awesome nordic ware bundt pan. ryan's parents bought it for him as a christmas gift, and we have been waiting for a chance to use it ever since. it has the coolest shape. 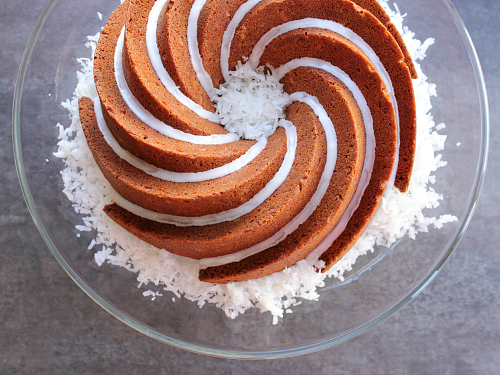 when we decided to make a coconut cake for easter, we just knew we had to make it in ryan's new bundt pan. 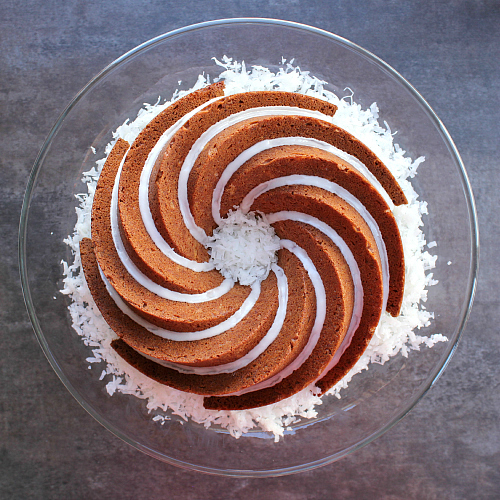 this coconut bunt cake is so good. the outside edges of the cake are perfectly crisp while the inside is light and fluffy. it has a great coconut flavor. the glaze on the top of it just adds the right amount of pizzaz too. 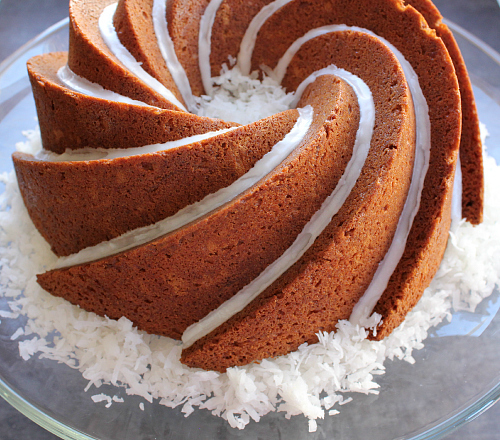 if you are a coconut lover, you have to give this cake a try! preheat your oven to 350 degrees F. in an electric mixer fitted with a paddle attachment, beat the butter until light and fluffy. add the sugar and beat for 3 minutes. add the eggs, one at a time, beating well after each addition. stir in the vanilla. in a large bowl, sift together both flours and the baking powder. add one third of the sifted dry ingredients to the batter and beat until just combined. mix in half of the milk. repeat with another third of the dry ingredients and the second half of the milk. then add the remaining third of the dry ingredients. beat until combined. fold the shredded coconut into the batter. spread the batter evenly into a greased bundt pan. bake for 40-45 minutes, or until a toothpick inserted into the center of the cake comes out clean. once baked, allow the cake to cool in the pan for 20-30 minutes, then turn the cake out of the pan and allow it to finish cooling on a wire cooling rack. to make the glaze, sift the powdered sugar into a bowl. whisk in the lemon juice and the water. drizzle the glaze over the top of the cooled bundt cake. the glaze will harden. top with additional shredded coconut if desired. Love the shape of the cake :) How unique! I really enjoyed the flavor of that cake. It was nice with a cup of coffee.